The nutritional value of peas is amazing when you think of the small size of a cup of peas. 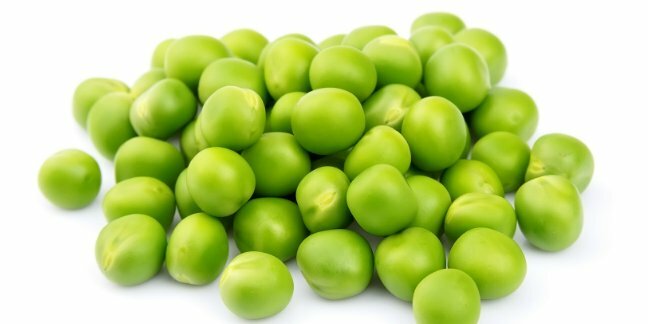 Did you know that one cup of peas contains more protein that a tablespoon of peanut butter and also provides Calcium, Vitamin A and C and Iron too. These wonderful little vegetables are a great first “green” food for baby as they are nutritious, and mostly pleasant to eat. When making homemade peas for baby, you may find it tough getting the “skins” to puree smoothly. If this is the case and your baby is not used to textures yet, you might wish to run them through a strainer or sieve. Contains other vitamins in small amounts. When can I introduce Peas my baby? Peas are typically recommended for introduction into a baby’s diet between 6-8 months old. As always, it is recommended that you thoroughly discuss any feeding issues with your pediatrician as generalities may not apply to your child. According to the EWG, peas are one of the 15 foods least contaminated with pesticides so purchasing organic is your choice. “When selecting fresh green peas, check the pod carefully. Look for peas that are firm, crisp, with a bright green color, and a fresh appearance. Fresh peas will feel almost velvet-like when you handle them. Try to buy medium sized pods rather than large ones. Avoid tough, thick-skinned pods, as this is an indication that the peas are over-matured, as well as those that exhibit poor color or show any sign of decay or wilting. Steaming or boiling peas in a scant amount of water is the best way to cook peas for baby food. For a nice flavor, cook peas in a homemade vegetable, chicken or beef stock. Step 1: If using fresh Peas, open the pods and scrape out the peas from the pod. If using frozen Peas (or Green Beans), cook according to package directions. Step 2: Place fresh peas into a steamer basket in a pan with a just enough water to slightly show through in the basket. Step 3: Steam until very tender; be sure to check on the water level. Step 4: Reserve any left over water to use for thinning out the peas. It is best to use the setting that makes the finest liquid purees – green bean and pea skins are rather difficult to completely puree. Using a blender rather than a food processor or stick mixer might be better as well. Plunging hot cooked peas into a bowl of ice cold water is known to help make a smoother puree. Step 1: Melt butter in a large sauce pan. Whisk in flour and allow to cook for 1 minute. Step 3: Add salt and pepper and other spices as you find appropriate. Step 7: Serve warm alone or over multi-grain toast or rice. Step 1: Bring broth to a boil in a large saucepan over high heat. Add rice and bring to a simmer; cover, reduce heat to medium-low and cook for 4 minutes. Step 2: Stir in peas and return to a simmer over high heat. Cover, reduce heat to medium-low and continue to cook until the peas are hot and the rice has absorbed most of the liquid, about 6 minutes. Step 3: Remove from heat and stir in scallions, mint and pepper. Cover and let stand until the liquid is absorbed, 3 to 5 minutes. This recipe is best served over a bed of Brown Rice. Begin cooking the rice at the same time you begin making this recipe. This recipe can be made in a microwave oven, on the stove top or in a wok. Step 1: Peel and dice the Onion. Peel and mince the Garlic. Cook the Onion and Garlic until the Onions begin to get translucent. Mix frequently. Step 3: In a cup or small bowl mix the Soy Sauce and Corn Starch until they are smooth. When the vegetables are tender add the Soy Sauce – Corn Starch mixture and continue mixing until the Corn Starch is dissolved and thickens the liquid, and evenly coats the other ingredients. Serve over the Brown Rice and enjoy. Thanks to All Creatures.org for this tasty one!